Ports team up with maritime and industry partners to tackle a challenge that has existed since the birth of shipping centuries ago – optimising port calls using standardized master and event data. The aim is to solve a very current issue : the reduction of greenhouse gas emissions in and around ports. comments Captain Ben van Scherpenzeel, Chairman of the Port Call Optimization project who is also Director Nautical Developments, Policy and Plans of the Port of Rotterdam. Established in 2014, the Port Call Optimization International Taskforce commenced its work to resolve the key question that has been asked by shipowners and operators alike. Namely : when my seaborne vessel plans to make a port call anywhere in the world, why is standard operational information needed for that call not available at the right time ? The work was considerable, and commenced with the creation of appendices with clear, industry terms describing the minimum information needed for the seamless business process of a port call that applies to every trade and port in the world. “We have used definitions from established international institutions, and in some cases even researched into relevant international jurisprudence to get these right first time” adds van Scherpenzeel. With up to 1,200 ports throughout the world receiving anything up to 55,000 different types of ships, the International Taskforce kept its focus on and faith in three credos : simplification, unification and standardization. 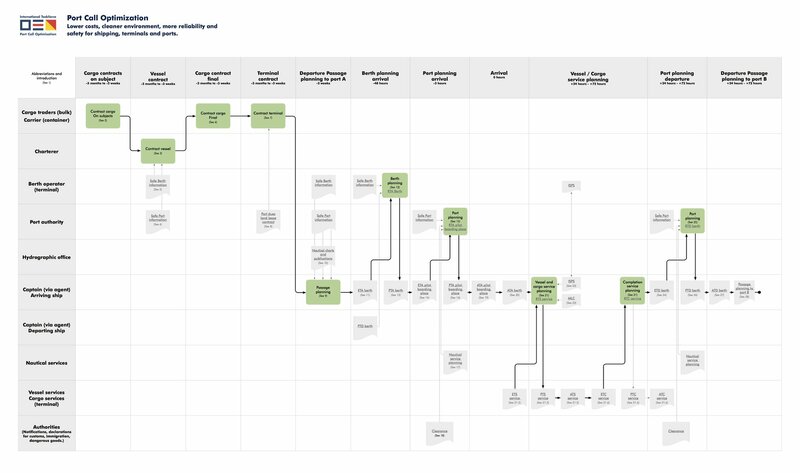 By agreeing on the scope of data, functional definitions and their use the International Taskforce has now reached a consensus on a data model, its formats and usage. This has triggered the development of two critical tools now being tested to facilitate the interchange of accurate information by each data owner with each other in the port call process. Avanti is a project that is developing a real time system designed for Harbor Masters to enable them to provide accessible, accurate information to all port users in order to optimise a vessel port call. Pronto is a project which comes as a spin off from Avanti which is developing a simple system where all port service providers (including terminals, bunker barges and pilots) can update their starting and completion times in order create a timetable per vessel. This in turn significantly reduces to the one-to-one and one-to-many communications that often duplicates processes and complicates interactions between the port community and its trading partners during a vessel port call. concludes Captain Van Scherpenzeel. 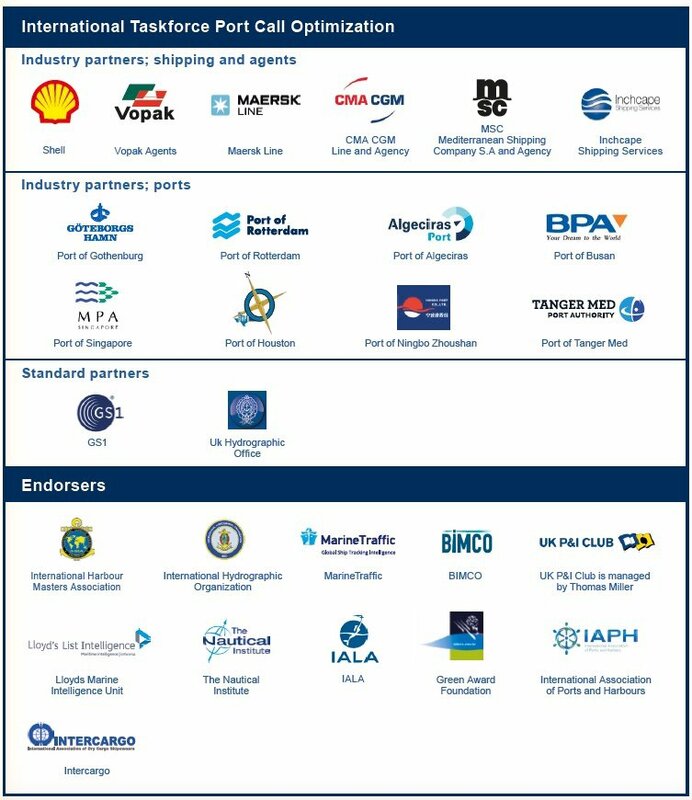 Following work with Taskforce partners, standard partners UKHO and GS1 and the endorsement of the ports and maritime industry including IAPH (see footer), the Chairman of the International Taskforce and his team will present their project at the upcoming Marine Environment Protection Committee meeting at the IMO in London in October. One of the main environmental issues that the MEPC is looking into is the reduction of Greenhouse Gas (GHG) emissions from ships. “The IAPH has established its World Ports Sustainability Program to respond to worldwide, regional and local challenges, such as climate change, mobility, digitalisation, migration and social integration. This project is a fine example of Ports teaming together with their customers, public stakeholders and custodians to achieve port call optimization, which in turn will lower greenhouse gas emissions. Shipping and ports are working together in an international taskforce promoting “Port Call Optimization” through improving quality and availability of master and event data which will deliver benefits to ports, shipping lines, terminals, service provides and society. The aim is for lower costs, cleaner environment, more reliability and safety for shipping, terminals and ports by means of two initiatives. The Avanti project aims to improve the quality and availability of master data such as depths and admission policies. This will ensure vessel – berth compatibility and a clear understanding when it is safe to arrive or leave. The Pronto project aims at improving the quality and availability of event data: for example, planned time of arrival berth and estimated time of completion cargo operations. This will enable just in time planning of pilot on board, pre-planning of all port services and planning to the next port.